Syncious provides multiple solutions targeting HPC-As-A-Service. Family of solutions by Syncious towards HPC is called as SyncHPC. One of the solutions (SyncHPC-E) caters to large scale enterprises with multiple HPC user accounts. Another solution (SyncHPC-S) provides simplified workflow for individual users. This blog explains the workflow of SyncHPC-S.
Small and medium businesses and academic sector need simple and cost effective solution for on-demand HPC. SyncHPC-S is developed to serve these sectors. User can select an application from many available choices in various categories. The applications are categorized based on Industry types. E.g. User can select an application “OpenFOAM” with required version form “CAE” industry listed on Syncious portal. Once an application is selected, user can verify the details of the application along with key features. Then, he/she can easily configure HPC deployment cluster of their choice. An estimated per hour cost for above configuration will be shown for reference. User can also setup a virtual private network (VPN) connection between his/her premise to cloud based HPC cluster. The selected HPC cluster will be deployed on cloud within few minutes. Once HPC cluster of required configuration is deployed, then user can easily manage and monitor it using a dashboard provided for HPC administrator. Below image shows an example dashboard for HPC Admin on Syncious portal. Users can scale up and scale down HPC cluster based on requirement of number of CPU cores. Following image shows a slider to scale up/scale down HPC deployment. Remote Visualization:Users can connect to Head node using remote visualization technology. E.g. Windows head node can be connected using Remote Desktop Connection. Then, user can directly submit the jobs from any compatible application from desktop GUI. User can also monitor the job status using ‘Monitor’ option provided in dashboard. As discussed, SyncHPC-S is a self-service portal for on-demand HPC. It covers the overall user workflow for single user with HPC deployment. 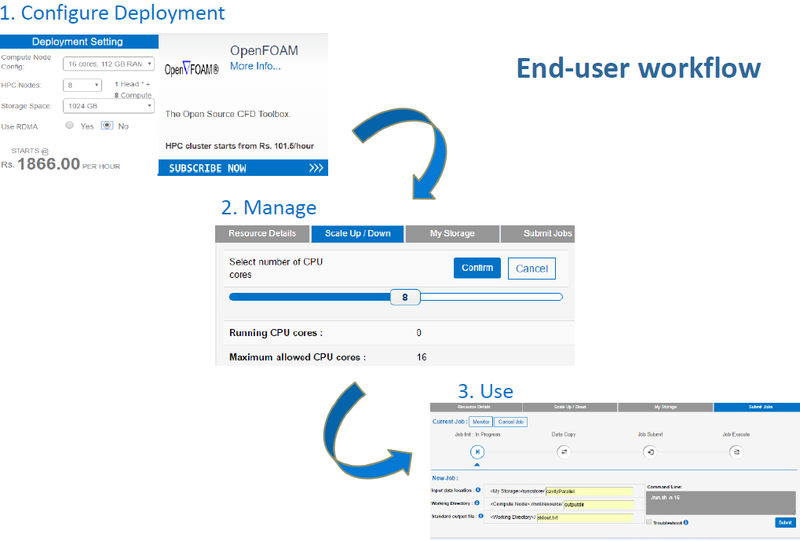 User can easily deploy, manage and use HPC cluster with four-step workflow.